Air New Zealand's Future Today.As Air NZ's 6th Boeing 777 nears completion, Rob Neil visits the Boeing factory for a behind-the-scenes look at the technology behind this mighty airliner and rest of Boeing's model line-up. Captain Geoff Cooper, one of Air NZ's 777 Training Captains, gives Pacific Wings' readers an insight into what it is like to fly the Boeing 777. Callum Macpherson continues his entertaining and informative look at the reality of gaining a private pilot's licence. 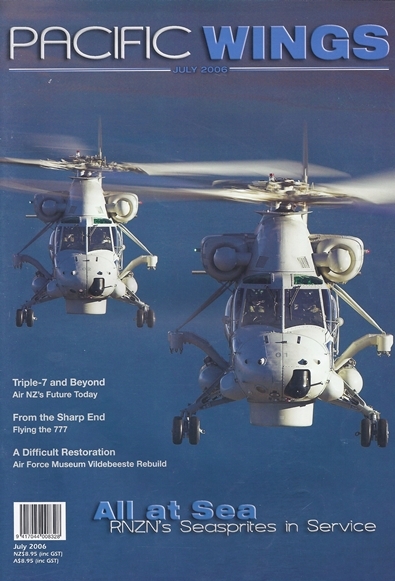 As Australia suffers problems with its Kaman SH-2G (A) Seasprites, Pacific Wings correspondent Andy Heap finds it is a different story on the other side of the Tasman when he talks to those who take New Zealand's SH-2G (NZ) Seasprites to sea. Jill McCaw visits the Air Force Museum at Wigram and sees how much effort volunteers are making to preserve a little-known, but important RNZAF type, the Vickers Vildebeeste.